There are four apartments at our guests' disposal, situated just 250 metres from the beautiful beach. Each apartment has its own entrance, a double bedroom, a sitting room with small kitchen, dining room with sofa with one or two beds, large bathroom and a balcony that overlooks the sea. The building is situated in quiet location in the pine-wood. 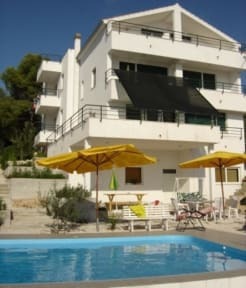 Beautiful swimming pool is in front of house, sun beds, barbeque with big table are at your disposal. We are a family of four offering traditional hospitality in Trogir, a medieval walled city which was declared a UNESCO World Heritage Site in 1997. Trogir is 28km from Split and is a place full of interesting history and architecture, as well as natural beauty. Our location gives you the opportunity for year-round relaxation, long walks, cycling through untouched nature, fishing, tennis, sailing, water-skiing, surfing, paragliding or excursions to the nearby islands. We are also only 2km away from the downtown area with its nightlife and many restaurants offering Mediterranean cuisine. You will also want to explore the old city with its many Romanesque and Renaissance buildings including the Cathedral of St. Lovro, Cipiko Palace and Kamerlengo Fortress. The owners speak Italian, French, German, Slovenian and English.